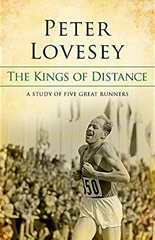 This, my first book, grew out of my strong interest in the history of athletics, It followed the careers of five great distance runners – Deerfoot, W.G.George, Alf Shrubb, Paavo Nurmi and Emil Zatopek – who competed at intervals of about twenty years from the 1860s to the 1960s. Little had been written about the first three, and Deerfoot was practically unknown, in spite of having been a sensation in his time. Each athlete was given a chapter and there were more chapters comparing them and the conditions in which they trained and competed. The foreword was written by Harold Abrahams, the Olympic champion later immortalised in Chariots of Fire.